CinemaCake has captured a lot of fun surprises at weddings in the past. From our couples breaking out into a perfectly choreographed first dance, to a spontaneous fireworks display, we had thought we had seen it all! That is, until Lisa and Paul's wedding reception. This beautiful reception started out with a traditional first dance and a fabulous dinner served to all 500 guests in attendance at Vie. Then, when the Father-Daughter dance began, everyone was blown away! Check out the ending of their Coming Soon Trailer, HERE! Months before her wedding day, Lisa had selected the song "My Little Girl", by famed country singer Tim McGraw, for her first dance with her father, thinking it would be a touching song for the BVTLive! 's JellyRoll to perform. Little did she know that her dad, Dave, had much bigger plans! Dave had secretly communicated with the song's co-writer and had McGraw sneak onto the stage and surprise Lisa at the reception! Alison Conklin was there to snap some beautiful shots and the CinemaCake crew was ready to capture some amazing footage, which you can check out in the sneak peek we released the day after the wedding! Of course, it isn't every day that a three-time Grammy winner stops by a wedding for an impromptu concert! Philadelphia Wedding Magazine gave everyone the behind-the scene scoop an interviewed each of the vendors involved in the wedding. You can check out their article HERE! This story also became national news fast and Lisa and Paul were interviewed by a couple of news outlets about their out-of-this-world reception. Here is an interview they did with Fox 10 in Phoenix, complete with some of our clips of the jaw-dropping performance! McGraw stayed at Lisa and Paul's reception after the Father-Daughter dance and performed a full set of songs for the newlyweds and their guests! Special thanks to all involved, including Cescaphe Event Group, the amazing team at Vie, Alison Conklin Photography, Beautiful Blooms, and BVTLive! 's Jellyroll! Summer Weddings in the City! This summer, CinemaCake has sent crews out all over the "City of Brotherly Love" to work with amazing couples and capture some truly beautiful wedding days. One of the best parts of filming in Philadelphia is all of the gorgeous and unique spots that this city has to offer. We have had the chance to film in several beautiful ballrooms, a green house, and even a museum! Here are some of our favorite trailers from this season of weddings. Upon first review of Gabriela and Mike's wedding website and their beautiful engagement photos from Paris, we knew right away their wedding day would be nothing short of elegant. This adorable couple planned a traditional day and added personal elements throughout their reception at the Hyatt at the Bellevue, located in the heart of the city. Guests were seated at tables named for the couple's favorite Dave Matthew's Band songs and their card box resembled their adorable pooch! 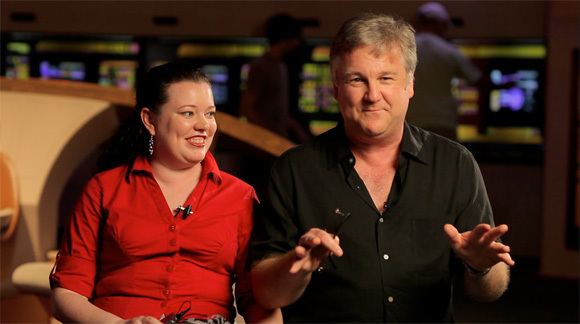 We loved working with Gabriela and Mike and we were thrilled to hear from them after we shared their trailer! "We LOVE it! I have watched it five times since we first opened the email and keep picking out new things. Thank you so much for capturing our day and personalities so well, we couldn't be happier with the result! We loved working with your team this past Saturday, they were fantastic!" When we first met with these high-school sweethearts, they told us that their wedding day would be a fun one; and boy did they deliver! From a lively morning with Maddie and her bridesmaids during preparations, to the amazing dance moves at the end of the night, this sweet couple had a great time and made sure everyone around them did too! Maddie and Dan each wrote to us after they saw the trailer for the first time and both sent such heart-felt notes. "Literally watched it the second I got home for lunch. Dan and I CANNOT stop smiling! Didn't think it could turn out that amazing!!!" "I wanted to take a second to echo what Maddie said. I know this is only the trailer but we could not be more thrilled with how it came out. Every shot is gorgeous. I also just wanted to say that the film crew on wedding day was incredible. For the most part, we barely even noticed they were there! Thanks again for the great work." When Lyndsey and Vincent first reached out to us about filming their day, we knew this was an event that could not be passed up! They had decided to host their wedding at not one, but two of the most iconic art establishments in the city and their day was sure to be filled with love, beauty and elegance. The couple said, "I do!" in the gardens of the Rodin Museum and took photos with their guests in front of an enormous and gorgeous flower wall. From there, everyone traveled to the Perelman Building and each was greeted by traditional Taiko drummers. The guests then dined at one long, beautifully laid table that stretched nearly the length of the gallery. They danced to live music performed by a CinemaCake favorite, JellyRoll! The night was truly a spectacular one and you can check out all the moments in their Coming Soon Trailer, below. We didn't just get to film in Philadelphia this summer! Check out our collection of trailers from the summer and see some of the beautiful weddings we captured throughout PA, the Jersey shore and Delaware! Coming Soon Trailers are in season! Wedding Season is officially upon us and our crews have already had a chance to work with some unique and amazing couples! We were so thrilled when each of our recent brides personalized their CinemaCakes with a Coming Soon Trailer. They can’t get enough of the cinematic sneak-peeks, which we deliver within just a few days of their wedding celebration. Here are a few of our latest trailers! "Jess, Craig, Dave and Sheryl, you all did such an amazing job capturing one of the most incredible days of our lives! Not only was your team fun to work with but it seems like they are an extension of our family. Was so great to share the day with you all and even more touching to see what you all shaped from the raw material captured... Excited to see the rest as it come! I was so excited to see your email. While watching the video I kept thinking, "Oh my gosh this trailer is absolutely amazing"! James and I are speechless. We keep watching it over and over again! Thank you so much for sending this to us. We can't wait to see the full video and relive the bet day of our lives. Liz and Greg’s Wedding Featured on Style Me Pretty! The trailer is AMAZING! We love it and are beyond excited for the film to come out. Thank you so much!!" You can see several of the beautiful moments in their cinematic sneak peek, below, and you can check out the full post about their wedding day HERE! Becky and San’s Wedding Featured on Style Me Pretty! Featured on Style Me Pretty: No doubt about it, The Lord Thompson Manor knows how to throw a wedding. Like the kind that has immaculately manicured grounds, elegantly arranged florals and perfectly personalized details – so yeah, basically the BEST kind. But, don’t take our word for it. Browse Tara Lynn Sen’s beautiful shots in the full gallery and Cinemacake’s sweet film! Since the beginning of May, our team has accomplished some pretty amazing things! 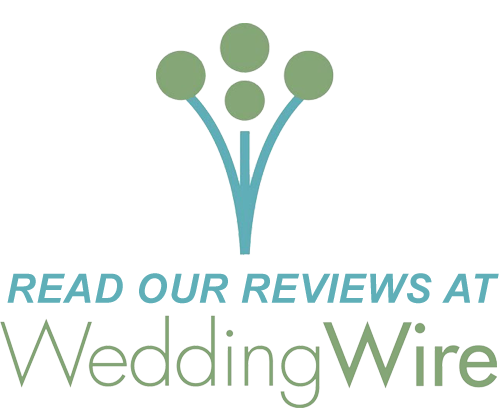 We have filmed a total of 27 weddings and more than half of our couples have ordered and received their Coming Soon Trailers! Our brides can’t get enough of the cinematic sneak-peeks, which we deliver within just a few days of their wedding celebration. We can’t fit all of the amazing Coming Soon Trailers into one blog post, so here are just a few of the first films of the season! Kristina and Bobby celebrated their wedding in May at the Union League of Philadelphia. This day held a special meaning to our team because we had worked closely with this couple on other projects before we arrived to film their wedding. For the past two years, we have created films for the Terri Schiavo Life & Hope Network, which is the non-profit organization Bobby's family created in honor of his sister. We were thrilled to be a part of their wedding day and hear that both Kristina and Bobby loved their Coming Soon Trailer! "This trailer is INCREDIBLE! We absolutely love it!!!! The day and night of the wedding flew by so fast (as we knew it would), and now more than anything we're so excited and thankful that we'll have our CinemaCake films to remind us of everything that happened and to bring us right back to that wonderful day---almost as if we were there again---for so many years to come. Between your amazing work on the Love Story and this trailer, you guys are gonna have your work cut out for you to try to top what you've done so far with the final film.....But don't worry, we have faith in you! "Dave! We LOVE the trailer!! It is perfect!!! Be sure to check back for our next set of Coming Soon Trailers soon! How One Bride Created Her Own Personal Flair! On the night of Sara and Sean’s wedding, there were many speeches given about the happy couple and the attributes each of them possess. Kevin, Sean’s little brother and Best Man, talked about everything that Sean had accomplished in school and now in the workplace. Sara’s family talked about her creativity, her determination and her clear love of fashion and design. Sara’s eye for style was evident throughout the wedding, from her ornate wedding dress, to the time and energy she put into the look of their reception. Sara, who has an extensive background in fashion design, not only picked the decor that was used throughout her day, but she actually designed specific pieces as well! When we asked the couple what they were most looking forward to, Sara wrote the following: “We are pretty excited about our decor that we have worked closely with Evantine on. I designed three prints that were printed on fabric that was then sewn into the dinner napkins for the ballroom, as well as into a few throw pillows in the lounge area outside of the ballroom.” She also created the long skirt that each bridesmaid wore over their sequined gowns, giving the dresses a totally new and elegant look. Throughout their entire Coming Soon Trailer you can see the effort that this couple put into making their day perfect and uniquely their own. Before the end of the reception, we were able to get all of our clients together for a photo. Just look how many of our brides and brides-to-be were there! 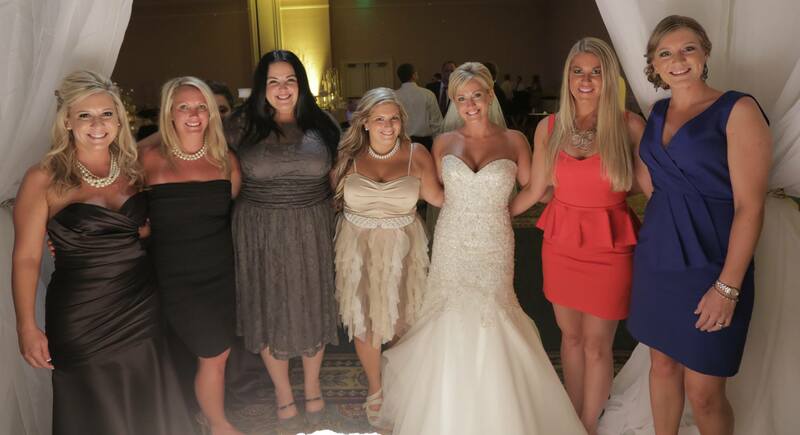 From left to right, here are 5 CinemaCake Brides and 2 CinemaCake Brides-to-Be in one place! We love working with this family! Thank you, thank you, thank you. I’m so sorry for the huge delay! We didn’t have any reception or internet access while we were away on our honeymoon. Thank you for enabling us to re-live the best day of our lives. God I can’t wait to see the final product!! This made me so utterly happy. I can’t stop smiling. I just watched it 5 times in a row. I especially loved being able to see the reactions of my family and friends and to see so much captured that I didn’t get the chance to see that night. I love it. Pat loves it. And we’ve only shared it with a few people so far, but they are absolutely crazy about it. I’m outrageously eager to see the final product! I hope you guys had a good time at the wedding! I hope you were able to have some fun and were entertained by some crazy dancing! The whole day exceeded my expectations and my hopes. I was pretty devastated about the ceremony not being outside in the courtyard as I had planned for and dreamed of, but I think it was incredibly special and intimate inside the ballroom. Our florist, lighting, and the Four Seasons did unbelievable job transforming the room - which you certainly captured. And we worked so hard on writing the script so to speak and our vows for our ceremony, and I think it was all worth it. And then to see how they flipped the room for the reception and the massive amount of time we spent picking out table cloths and glassware and centerpieces - it was more stunning than I could have imagined. Oh, and guests adored our Love Story! So many people commented on it. I’m so thrilled Kathy (The Wedding Factor) introduced us to you. I’m so happy and honored to have worked with you. And I can’t wait for what’s next!! The Love Story that Stephanie refers to above is actually the pre-wedding film we produced and shared with all of the guests at the beginning of Stephanie and Pat’s reception. Hear the amazing story of this couple’s relationship below! Often our clients opt for the Coming Soon Trailer which can be delivered online in less than 48 hours of the event. It just so happens that this past weekend, Saturday and Sunday’s clients wanted that instant gratification. Here is a peek at both weddings. If playback stutters, be sure HD IS OFF in the upper right corner of the player. 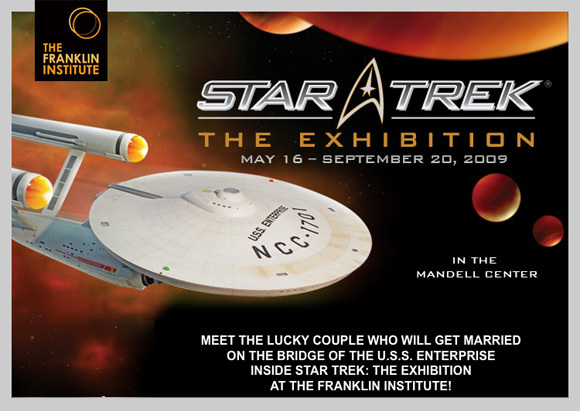 We have been commissioned to shoot Brad and Kate on September 13th as they marry on the bridge of the Starship Enterprise, which is part of the exhibit at the Franklin Institute in Philadelphia. Yes, the couple will be in costume. Meet the lucky couple who entered the contest to win this wedding. Kate is from Phoenixville, PA and Brad is from Denville, NJ. Hi, we’re Brad & Kate. We met almost three years ago at a Star Trek convention in Chicago, never suspecting we would meet the love of our lives there. 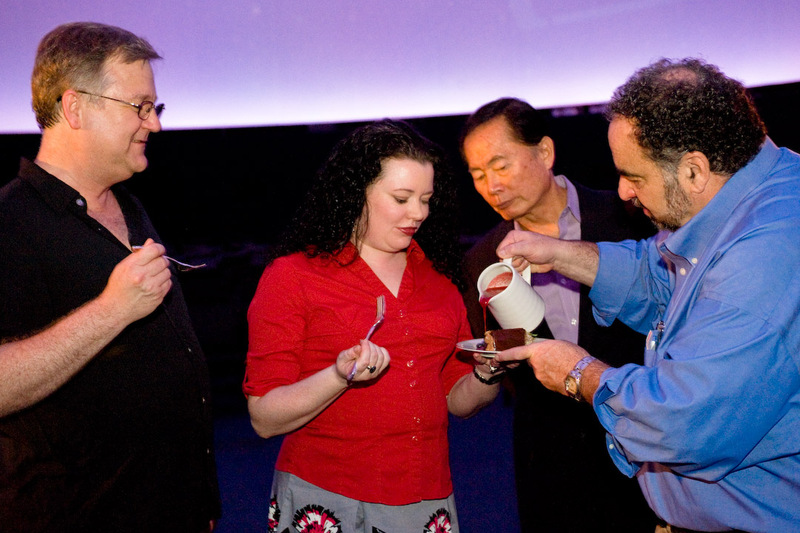 Our relationship continued after returning home, and in March of 2008, Brad proposed to me on stage at a Star Trek convention in New Jersey. We began planning our dream wedding in Las Vegas, on the bridge of the Enterprise D. We hesitated because our father would be unable to travel so far. 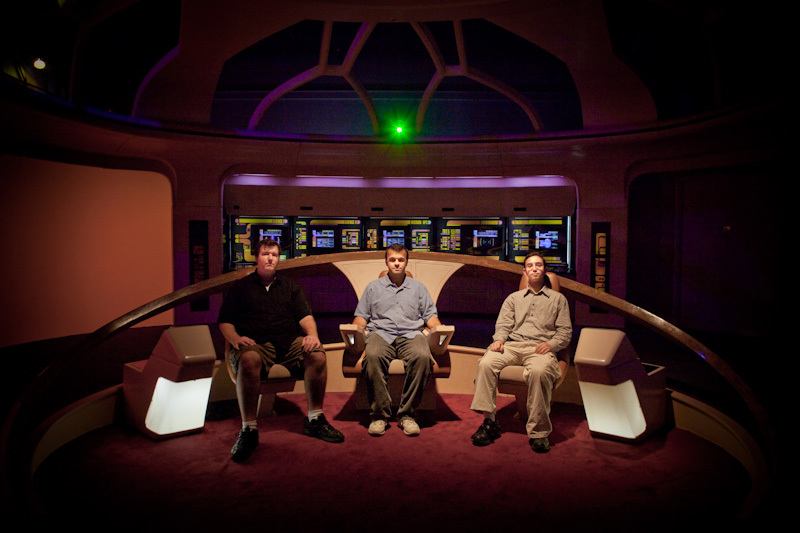 Our decision was made for us when, in the fall of 2008, the Enterprise-D bridge replica was torn down. Then when Brad’s father passed away earlier this year, it became essential for us to make sure my father would be able to attend our wedding in Pennsylvania. We realized it would be impossible for us to live the dream of getting married on the Enterprise bridge. But when we learned of the opportunity being offered at The Franklin Institute, we were ecstatic. Nothing would make us happier than to be able to pledge our lives to each other in the Star Trek universe, among our family, friends, and fellow Star Trek fans. At the August 20th cake tasting with George Takei, less than a month before the wedding, film crew - Jordan, Dave, and Josh - take a break on the bridge.